This string quartet has some technical difficulties, particularly for the first violinist, but the musical result is worth the effort, and players familiar with Beethoven’s quartets will enjoy playing it. 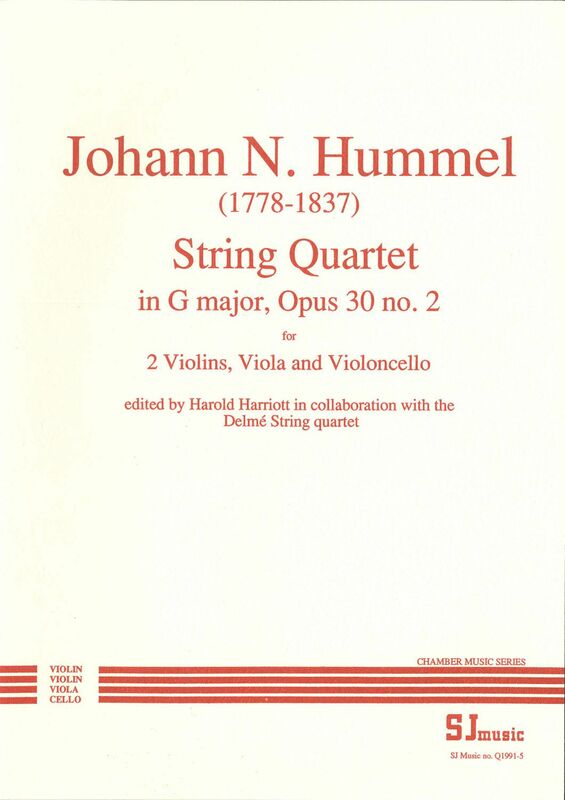 It is one of three Hummel opus 30 quartets published by SJ Music. All three are classical in style and pleasurable to listen to and play, and many would say that they have been unjustly neglected. Johann Nepomuk Hummel was a Hungarian pianist, conductor and composer born in Pozsony (now Bratislava) in 1778. He died in Weimar in 1837. Mozart heard him play, aged seven, in Vienna and was so impressed that he offered him lessons and took him to live with him for the next two years. Hummel then spent five years touring in Europe, including an extended stay in Great Britain, before returning to live in Vienna where he became good friends with Beethoven. In 1804, he was appointed to succeed Haydn as Kapellmeister to Prince Esterházy in Eisenstadt, and this quartet was composed at about that time. He left this post in 1811 and spent the rest of his life in various positions in Vienna, Stuttgart and Weimar. Hummel dedicated the three opus 30 string quartets to Prince Lobkowitz, who was also a patron of Beethoven. In consultation with the Delme String Quartet, a few extra bowing and dynamic indications have been added by the publishers.